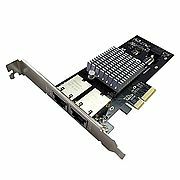 This 10Gbase-T network card (NIC) lets you add two RJ45 ports to your server or desktop computer and access your network at multiple speeds: 10G, 5G, 2.5G, 1G and 100Mbps. Compliant with IEEE 802.3u/ab/an and IEEE P802.3bz standards, the network card delivers a dependable way to upgrade or replace your existing network ports with dual 100Mbps/1G/2.5G/5G/10G compatible RJ45 ports, providing throughput capability of up 10Gbps in each direction (20Gbps total). It connects through a single, four-lane (x4 or higher) PCI Express slot.